My latest book The City of York: A Masonic Guide is now out with Lewis Masonic, priced £8.99, and is available through the Lewis Masonic website or on Amazon. 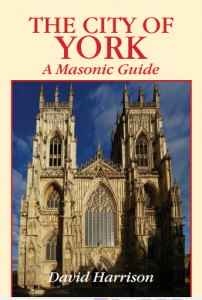 The book gives a street-by-street guide of all things Masonic in the ancient city of York, and acts as a companion piece to my earlier work on the York Grand Lodge. The new book looks at all the Masonic meeting places in the city; from the current Masonic Halls of Duncombe Place and Castlegate House, to the old taverns of the city such as the Punch Bowl Tavern and the Black Swan. The book also discusses how the Yorkshire Museum began its life with subscriptions from well known local Masons such as Godfrey Higgins and Robert Sinclair, and how the Minster has countless Masonic references, aside from having a rich history that reveals an insight into the working lives of medieval stonemasons. The city of York was also the home of the York Grand Lodge, or the Grand Lodge of All England held at York, the northern bastion of independent Freemasonry during the eighteenth century, and the book also analyses the legacy of the Grand Lodge on the city. The book is fully illustrated with index, map and references, and I hope you enjoy reading it as much as I enjoyed writing it.